Let's keep this intro part short so we can get to the part where I get to talk about the food. 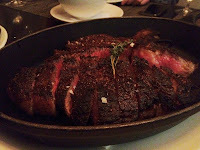 Jacobs & Co Steakhouse is probably one of the best steakhouses I've been to. So what made this dinner so memorable? Well it starts with the environment. The restaurant is elegant and polished, with cool decor that radiated class and luxury. I'd say I was pretty presentable that day, but walking into the dining room, I immediately felt under-dressed and intimidated. But that immediately melted away once we were seated at one of the booths around the perimeter of the restaurant. They were so comfy! Next thing to commend upon is the service. Simply impeccable. And it's probably one thing that Jacobs & Co Steakhouse prides on. Their servers are extremely knowledgeable, taking out any initial intimidation remaining in me. Seriously, I don't know how it's possible for one person to know so much about beef. He begins to explain that all of the meat served at Jacobs & Co Steakhouse is dry aged in-house, and they have a viewing window to the cellar for whoever wants to take a peak at where all the magic happens. I unfortunately don't have a picture, but it was quite a sight to see all those cuts of meat in one room. To help us decide what to order, our waiter proceeds to break down the differences in taste and texture between each cut of meat. In a nutshell, corn-fed cows will produce a buttery taste, whereas grain and grass-fed cows are not as tender but much more flavourful. Good tip to keep in mind! After mulling over the menu, a plate of poppovers arrive. They are essentially yorkshire puddings, and I don't think I could've asked for a better way to start the meal. They look big, but are baked so light, fluffy, and hollow on the inside. The tops have a nice flakey crunch, and were delicious with the herb butter melted on it. To balance off the barrage of meat and potatoes that would be soon served to us, we decided a salad would be a good idea. The most prized salad is the Caesar Salad, made entirely from scratch next to your table. A commentary was provided as we watched our dressing and salad being made. A highly recommended order! You can't really tell from this picture, but the Stuffed Baked Potato was about the biggest potato I've ever seen. It was like a small foot ball! All the sides were actually quite sizable and more than enough for sharing. But by far the Duck Fat French Fries were my favorite. Really rich in flavour, and I enjoyed dipping them into all the different condiments that came with the steak. Because not everyone enjoys their steak flavoured the same way, instead of pre-garnishing each peice of meat, the server brings out a selection of different condiments and rubs. Herb butter, chili soya sauce, chimichuri, salt and garlic flakes. The most interesting for me was the volcano salt. A powerful smokey salt. A little really went a long way! All of their steaks are char-broiled in cast iron pans. This is the key to their great tasting steaks. The cast iron reaches the perfect scorching 1,800°F temperature to crust the exterior and retain juices, while the flat pan allows for even heat distribution. And let me tell you, you could really tell the difference. These steaks were AMAZING. The combination of a good cut of meat and perfect cooking technique made these steaks so tender and flavourful. It explains why they don't use serrated knives, because you don't even need one to cut through the meat! I'm not a huge carnivore, but I throroughly enjoyed each and every bite. After our meals, we were given an attractive dessert menu, but at that point I don't think I could for the life of me eat another bite. Instead, the server brought out a plate of small bite-sized treats, and a tray of what he referred to as "pot cakes" to take home for breakfast the next day. Filled with cinnamon and chocolate, it made me so happy the next morning! By a big margin, Jacobs & Co Steakhouse is one of the better steakhouses I've been to in Toronto. I wouldn't hesitate for one second to return if it didn't cost such a pretty penny. But everyone splurges once in a while, right? Definitely put this one away for a special occasion!